That near-mythical 10X (of current lithium cells’ energy density) battery hangs out there on the distant horizon, promising automobiles that can exceed 1,000 miles range, or light aircraft that can carry four at Cessna-like distances. Right now, we have two-place trainers good for an hour’s laps around the circuit, and the hope for improvements soon. OXIS Energy, a UK-based company, has achieved 425 Watt-hours per kilogram at the cell level, and looks to go higher in the near future. Lithium-Sulfur – A Worthy Alternative? Promoters of lithium-sulfur batteries suggest their products have several desirable characteristics and performance boosts that may transcend the limits of lithium-ion cells. Sion Power, for instance, claims availability of their Licerion battery with an even better 500 Watt-hours per kilogram and 1,000 Watt-hours per liter. OXIS’ 16-Amp-hour pouch cells are currently available for High-Altitude Pseudo Satellite use and Sion’s batteries have been used in Airbus’ Zephyr HAPS program. OXIS works along several development lines, and CEO Huw W. Hampson-Jones explains their direction and future. 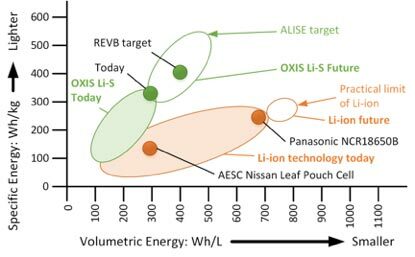 Note that battery management systems, packing, and wiring for these cells will reduce the total capacity per kilogram, although they should still be more potent per pound than their lithium-ion competitors. Several other factors come into play that add to lithium-sulfur cells’ attractiveness. The cells can be fully discharged without damage, for instance, something that would shorten the life of a lithium-ion battery significantly. They have a broader temperature tolerance range than lithium-ion. And they can withstand nail penetration without bursting into flames while continuing to deliver their rated voltage. An even more brutal test pits an OXIS battery pack against a NATO 5.56 mm round (roughly equivalent to a .22 caliber long rifle shell). Kokam managed such a demonstration in 2016 with their lithium NANO battery, showing their ability to withstand military use – something also aimed for by the OXIS pack. OXIS is working on packs to HALE aircraft and other drone use, and on a 30 kW-hr battery pack for a two-seat light aircraft under development. All this bodes well for future light aircraft and larger electric airframes. high altitude pseudo satelliteHuw W. Hampson-JonesKokam batteriesLicerion cellslithium-ion batteryLithium-sulfur batteryOxis EnergySion Power Inc.